Everyone has that one friend. The friend who repeats everything that he or she says. Their name and face just popped into your head. If no one popped into your head, then the friend is probably you. This person isn’t wrong and depending on how close you are with them, they may or may not be really annoying. At The Sports Script, I am that person. But if you have been reading my articles every week you probably already know that. I have actually been giving you a double dose of repeating on a weekly basis, and I can’t even say I am sorry about it. Here are the two things that I repeat on a weekly basis. Before we move ahead to week 9 and look back at the two statements above, let’s look at what happened last week. I gave out three defenses that were readily available in almost all leagues. Let’s see how we did. 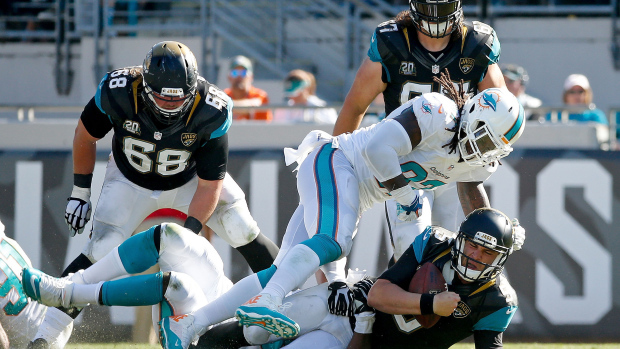 Miami Dolphins: The Miami Dolphins absolutely killed it on Sunday against the struggling Blake Bortles. The 3rd overall pick in the 2014 draft threw two picks that were returned for touchdowns and was also sacked 4 times. Miami led ESPN standard scoring in week 8 with 26 fantasy points. Not a bad day at the office. Buffalo Bills: The Jets are a mess. Geno can’t throw, Vick is older than dirt and Percy is just there to stir the pot a little bit. The Bills took full advantage on Sunday and sacked the QB duo 4 times while picking them off 4 times as well. An all around great day for the Bills defense (16 fantasy points) as they head into their bye week. Cleveland Browns: Jacksonville, Oakland, Tampa Bay. Any coach who sees those three teams on a schedule is going to smile. Put them in a row and they might jump for joy. In week 8, Cleveland was in the middle of that stretch of “easy games” and welcomed the Oakland Raiders into town. Oakland was intercepted once, sacked three times, and they fumbled twice before the day was done. Now, the Browns have Tampa Bay coming up from Florida and should be ready for another prime matchup. Only owned in 20.2% of leagues, let’s squeeze the juice out of the orange and ride this streak out with one more great performance from a defense that has done well the past two weeks. Kansas City Chiefs: Arrowhead Stadium is crazy; it’s one of the loudest places in the NFL to play and Kansas City welcomes the Jets into town for week 9. Rex Ryan has made the quarterback switch to Michael Vick and I think that Kansas City will have a field day with it. I wouldn’t be surprised to see 3 or so interceptions with 3 or more sacks. The Chiefs defense is no walk in the park and the Jets offensive line might as well pave sidewalks for the defensive line of Kansas City this week. Kansas City is one of only a handful of fantasy defenses that has provided positive scoring in every week this year. Also, they had seven sacks last week. Minnesota Vikings: The Minnesota Vikings have been an underrated defense the past few weeks. In the last two weeks alone they have 34 fantasy points in ESPN standard leagues and at least 4 sacks the past three weeks. They have three performances this year that have lead to double-digit fantasy production as well. In week 9 #TeamTeddy put the Vikings up against Washington. We currently don’t know who the QB will be in Washington but I don’t think it will make a difference to this defense that is taking down any QB in its path the past several weeks. Like Kansas City, Minnesota has had positive fantasy production every week this year. There you have it, three defenses to look for on your waiver wire, and a couple more that you will want to scoop up if others in your league have not been paying attention. Good luck in week 9 and as always, happy streaming!